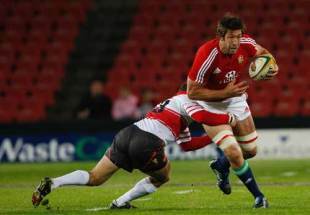 British & Irish Lions lock Nathan Hines has been banned for a week following a dangerous tackle during the tourists' 13-13 draw with the Emerging Springboks in Cape Town. Hines made the tackle on his opposite number Wilhelm Steenkamp and dropped him to the ground. He appeared before Canadian judicial officer Alan Hudson at the Western Province Rugby Union offices in Cape Town on Wednesday where his ban was delivered. Hines was represented by Richard Smith QC, while Lions manager Gerald Davies and head coach Ian McGeechan were also present at a hearing in Cape Town today. Hines, who will now only be available for the third Test in Johannesburg on Saturday week, has 24 hours to appeal against the decision. Hudson found 58-times capped Hines to be in breach of law 10.4 after he was reported by New Zealand citing commissioner Steve Hinds. Hines had been in the frame for a spot on the bench at least for Saturday's second Test in Pretoria, with his ban now opening the door to Ireland lock Donncha O'Callaghan and England's Simon Shaw.